Powers/Abilities: Most of the Outcasts have human to near-human intelligence, are more humanoid in size and configuration than their original forms, and some of them can speak. They have amplified levels of their normal animal abilities; many of them are stronger than human (one rock creature was strong enough to flip an army tank), some have dense exoskeletons, some have pincers, venom-filled stingers or fangs, wings, etc. Traits: The Outcasts fear outsiders, primarily because almost everyone they've encountered has tried to kill them. They seek peace, but they are willing to fight for their lives. (Incredible Hulk I#1 - BTS / Incredible Hulk II#329 (fb)) - The beings who would become the Outcasts were originally the normal flora and fauna of the desert of New Mexico. When Bruce Banner's gamma bomb exploded at Desert Base, many of the creatures outside of the blast zone were killed by the radiation. Those who lived were changed by the experience; both plants and animals grew larger, some stood up on two legs, some became wise, and some even learned how to speak. They were quickly identified as different and shunned by their own species, and when they tried to speak to people, they were hunted and killed. Eventually they discovered Banner's old, abandoned Desert Lab. The Outcasts made this their home, and some of them learned English from Banner's computers. The Outcasts also saw the Hulk (the Green One), who had come from the explosion, just like they had. They hoped that he would eventually come to him. 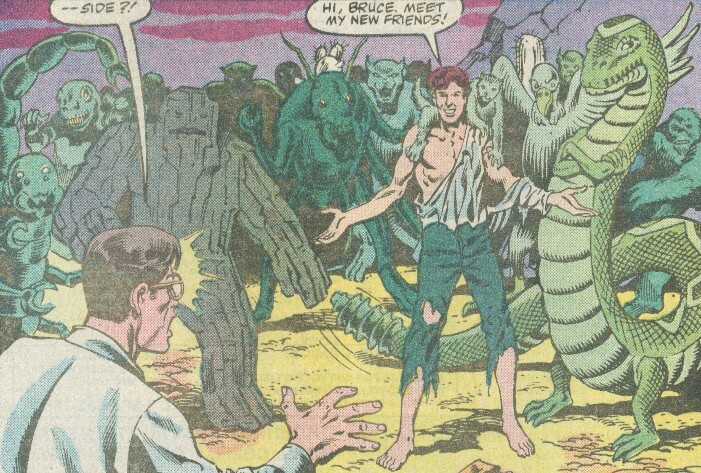 (Incredible Hulk II#329) - Rick Jones, having been transformed into a version of the Hulk that emerged at nighttime, sought out Desert Lab to enter its containment chamber, the Outcasts ambushed him. After overpowering him, they told him their origins, and then tried to lock him up. Just then the moon began to rise, and Rick turned into the Hulk. After a brief struggle, the Rick Hulk and the Outcasts realized they could be friends. In the following days, both Rick and his Hulk incarnation lived with the Outcasts, carving out larger tunnels, teaching them how to eat some of the preserved foods, and just enjoying the companionship of others unwelcome in normal society. However, Banner, who was just about the only one who knew that Rick was the Hulk, worried about his old friend and decided to check out Desert Lab to see if he was there. SHIELD agents working at Gamma Base had been keeping tabs on Banner, and they followed him out there. Banner arrived at dusk, just as Rick was turning into the Hulk, in which form he introduced Banner to his new friends. However, the SHIELD agents had followed closely behind. Instantly enraged by their presence, the Rick Hulk hurled a boulder to try to drive them off, leading the soldiers to return fire, and a battle broke out. The Outcasts held their own initially, but the superior fire-power of SHIELD soon forced them to give ground as many of their number were injured or killed. Enraged, the Rick Hulk smashed SHIELD's tanks and other weapons and drove off the agents. However, Rattilore and the other Outcasts realized that his was just a temporary measure, and that the humans would return in greater force within a short time. The Rick Hulk offered to stay and protect them, but Rattilore told him that before his arrival they had been left alone; Rattilore recognized that the men were hunting the Hulk, and that he must leave them, or that they must flee their home. Sadly, the Hulk agreed to leave, and Rattilore told him that they would go into the deepest tunnels and dwell in darkness. Comments: Created by Al Milgrom and Danny Bulanadi. They seem very similar to Dominus' minions, the Desert Dwellers, who appeared just one month earlier. Perhaps Dominus merely captured some of the Outcasts, brought them to his base in Arizona, and cloned them to form his servants. Or not. They also reminded me of the Lizard People, such as Serpentyne. The Outcasts must have mutated and developed much more slowly than it would originally appear from reading the issues. As far as I recall, Bruce Banner and his allies were visiting Desert Lab as recently as the #270s (I think that's where Rick irradiated himself while trying to gain power to help the Hulk against the Hulk-Hunters, in #269). Possibly they sensed him approaching and were able to temporarily evacuate or hide, but there was no evidence of their presence. I can't recall whether he's been back to Desert Lab since, but if so, there was no sign of them then, either. Only Rattilore was named. I named a few others, then ran out of steam. For the less obvious: "Ech" is short for the prefix Echino, which means spiny; "Eeek" said "Eek" all the time; "Iggo" is named for the Rock Ape of the Herculoids cartoon ( http://www.pazsaz.com/herculod.html ); "Kir" is for Khir, which has something to do with bats...I forget what; "Kkk-kkk" is is the noise the ant creature made; I think you can figure out the others. Maybe Khir is short for Chir. Chiroptera is the order of Mammels which bats belong to. (Cheiros=hand, pteros=wing). I'm not sure what the deal with that rock guy was...maybe he was a lichen that just looked rock-like? The Outcasts are among the Gamma Mutates in World War Hulk: The Gamma Files. All the names Snood originally gave the Outcasts in this profile became official in this book.